30th Sep 2016 - Pip to Plate and other bits and bobs! 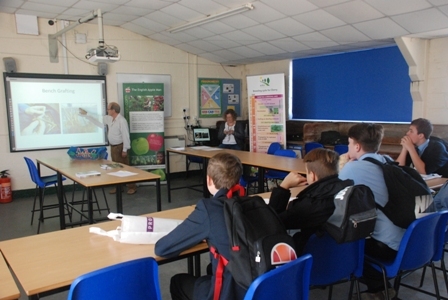 Pip to Plate offers young students at schools in the area an insight into the possibility of a career in the fruit industry or allied horticultural. 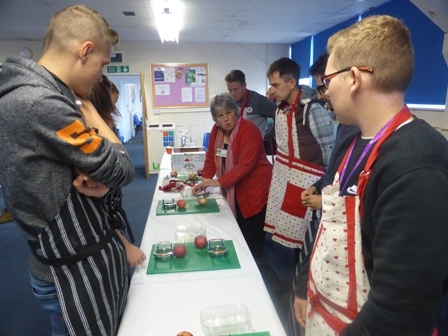 The Pip to Plate event came out of a discussion between The English Apple Man and Stefan Jordan - Lecturer at Hadlow College. Stefan 'got the ball rolling' and gave the event its title: Pip to Plate' is a simple process map from the beginning of the apple story, via science and breeding, practical instruction on budding and grafting, controlling pest & disease, biology & chemistry, applied science, harvesting, storage, ensuring quality at retail level, processing fruit and career opportunities. The English Apple Man has 'opened the show' with The Story of the Apple in each Pip to Plate held over the last 4 years; the second speaker presents Apple Breeding centred on East Malling Research (EMR) and Sarah Calcutt has covered this subject for the last 2 years. At this year's Pip to Plate, we were once again blessed with good weather; the 4th year on the trot! The students from each school arriving at 30 minute intervals, with the first arriving for a 9.30am start. The last group arriving at 1.30pm. 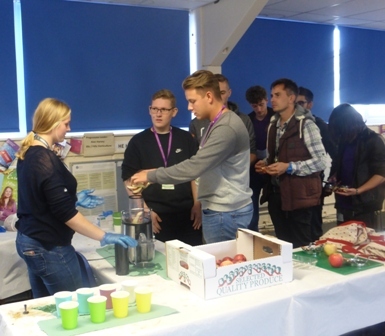 Each school group spent 2 hours rotating through the stages, with the last stop taking in QC checking demonstration for customer acceptance by Brian Tompsett with Theresa Huxley (Sainsburys Technical Manager) present and offering valuable interaction with the students, followed by a chance to be involved in turning apples they had picked from the trial orchard into juice. The very last element; a chance to discuss career opportunities with Hadlow College Careers advisors. Nurseryman Will Seabrook has supported Pip to Plate every year and again gave his valuable knowledge to student on propagation techniques, with practical demonstration of grafting. 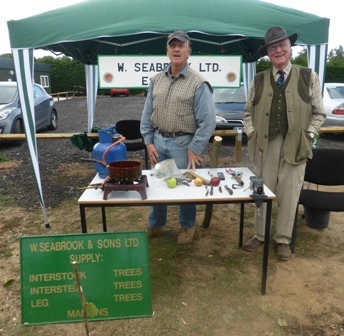 Accompanying Will; his brother Ben who lives in Canada where he is also involved in tree propagation. A surprise visitor to Pip to Plate; Sandys Dawes who grows apples and cherries at Herne Hill in East Kent and is a former Master of the Worshipful Company of Fruiterers. Sandys was on a 'observation visit' on behalf of the WCF. 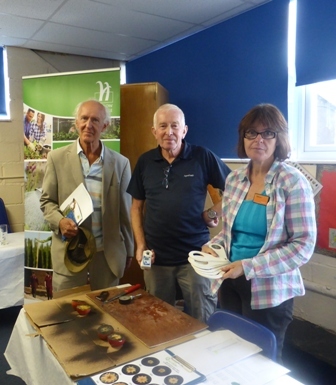 Brian Tompsett may be retired (well semi-retired) but his skills are much in demand and assists Hadlow College in the management of the trial orchards and has trained students in the skills required for preparing show exhibits of apples for The National Fruit Show. Theresa Huxley has championed the cause of UK fruit and initiated the Huxley Training orchard at Hadlow College. 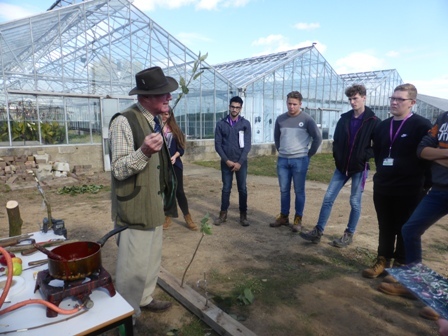 The day was; 'we hope' an inspiration for the students to consider horticulture as a career; in particular food production horticulture. The possibilities for a well paid career are considerable; the opportunities endless. The industry is now driven by new technology and needs bright young 'well trained' people to continue the growth of UK horticultural production. As Sainsbury's was named for the seventh year as the leading retailer of British apples and pears, it is thanks to its lead in backing, support and investment for growers that the industry is continuing to grow. In particular, its support of British Conference Pears is helping to transform the category. In The English Apple Man Journal for 19th August 2016 reported on the success in the EKFS Orchard competition for a ZARI apple orchard at A.C. Goatham's - Shrubbery Farm - the Journal also reported the outstanding promise of the new V system 'trial' Conference pear orchard and extensive new planting of Conference pears on the V system. AC Goatham & Son is pleased to report that it's investment in a new planting system for Conference Pears is continuing to be successful, with yields this year, its first cropping year (2nd leaf) predicted to be around 25 tonnes per hectare, rising to 65-70 tonnes per hectare at maturity. The current UK average is 17 tonnes per hectare. A C Goatham & Son is therefore continuing it's planting programme for new Conference Pear orchards, thanks to the support of Sainsbury's following the successful commercial trial. This year there has been a further 70 acres of Conference Pears planted at Turkey Hall Farm, Hoo, in addition to the 80 acres which were planted at Elmstone in East Kent 20 months ago, plus smaller plantings at Shrubbery and Boughton Mount Farms. The new orchards are being planted using a new 'V' growing structure together with a new shape of Conference Pear tree. These single trunk trees have four main fruiting branches. Trees are grown on a double trellis system, which increases light and air to all of the branches, so they are producing a much stronger and healthier fruit. There is also a significant reduction in russeting on the skin thanks to less branch rubbing. Ross Goatham, at AC Goatham & Son comments: "This year's predicted Conference Pear harvest is very encouraging and we are very pleased with the continued support of Sainsbury's in helping us to achieve this exciting turnaround for the category. They are really championing the future of British Conference Pears, as they have done with British apples over the last few years." "These new orchards will see meaningful cropping after just 20 months, similar to levels a traditional orchard would produce at their height, so that old adage about planting pears for heirs is no longer true. We are planting to preserve the category for future generations to enjoy. We believe this is the first significant investment in the industry for about 40 years and the support of our customers has been instrumental in our confidence and the scale of our new orchards. We anticipate this will become a template for the future of British Conference Pear orchards." Wealden distiller Greensand Ridge Distillery launches next week, and aims to put a new twist on fine spirits by using traditional Wealden crops, such as cobnuts, and surplus produce to make a range of premium alcoholic drinks. The distillery will launch with its first bottling of premium London Dry Gin, which includes eight botanicals that grow within a mile of the distillery, including cobnuts, gorse flowers and oak moss. They will also release a limited edition, and the UK's only Raspberry eau-de-vie; a delicate, clear, raspberry-flavoured spirit made from surplus, quality berries grown by local farmer Giles Cannon. Building and creating the Greensand Ridge Distillery started in July 2015 with the mission to reduce food waste at the farm gate by fermenting and distilling quality fruit that supermarkets won't take, and combining these with local botanicals such as cobnuts to make a range of unique spirits. Powered by 100% renewable electricity and with a zero target for chemical use and non-recyclable waste, it is a truly sustainable business. Gin lovers will also be able to visit the distillery, located just outside Shipbourne, as part of Greensand Ridge Distillery's Gin Experience, where visitors can create their own full bottle of gin in an individual copper still to take away with them. The business is the brainchild of Sevenoaks-born entrepreneur Will Edge who has worked in a range of jobs in IT, marketing and finance before he undertook a Masters Degree in Brewing & Distilling in order to return home to Kent and set about turning his love of spirits and craft cider-making into a livelihood. Will says "after so many years of practising my craft on a small scale, it's an emotional day for me when I can bring these ideas to drinks enthusiasts in premium, locally inspired products, and do so in a sustainable way." The English Apple Man has an invitation to visit Will's new enterprise and will feature the Distillery in a Journal in the near future!